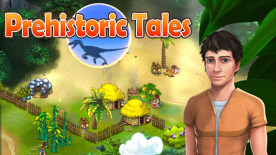 As you tend to your budding civilization - managing your resources well so you can feed and house the villagers - missions will appear on the screen, challenging you to undertake such tasks as clearing a cave of dinosaurs or defending the settlers from an invading army. There will never be a dull moment as you spend hours enjoying addictive gameplay, colorful visuals, and ear-pleasing music and sound effects. Take the first steps on an epic journey to greatness today!